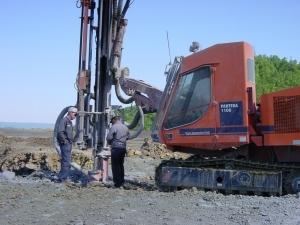 A quartzite quarry in Virginia wanted to increase its production and had also been experiencing problems with hole deviation. 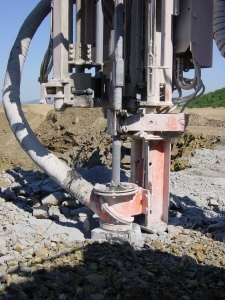 It replaced its drilling equipment with a Tamrock Pantera rig equipped with Sandvik’s new Sandvik60 drill steel. Productivity has gone up by more than 50 per cent, they’re able to use the same rig at two other quarries – and their holes are straighter. By Steve Minett. 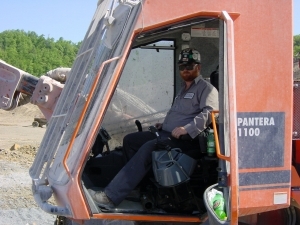 Salem Stone Corporation was started in 1983 when Leonard D. Hill bought the Sylvatus Quarry, near Hillsville, Virginia. Sylvatus is a quartzite quarry and the company now also owns six other quarries in Virginia and West Virginia. Three of them produce limestone products, one ‘accostone’ (which is a limestone variant) and two are sandstone quarries. Salem Stone employs 150 people, 22 of them at Sylvatus. 75 per cent of the stone produced from Sylvatus is used for road surfacing by the states of Virginia and West Virginia. This consists of fractions ranging in size between 3/57 to 2 inches. Other products include three classes of ‘rip-rap’, ‘erosion stone’, for road verges and stone for walling. In addition to raising productivity, the Pantera-Sandvik60 combination has also addressed the other major issue which motivated the company to change its drilling equipment; namely hole deviation. According to Roger Ramey, “the hole deviation problems which we were experiencing with the T45 steel have improved by about a third since we switch to Sandvik60. I believe that the female coupling arrangement in the Sandvik60 steels has contributed a lot to this improvement in hole straightness. Fig. 1. Salem Stone recently acquired a new Tamrock Pantera 1100 drill rig. Fig. 3. 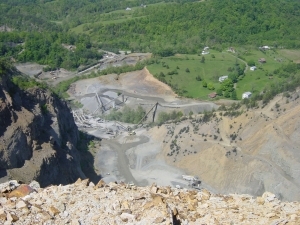 The Sylvatus Quarry, near Hillsville, Virginia.